Lucker Mill. Photo by Duncan Hutt. The parish of Adderstone with Lucker lies in north Northumberland on the coastal plain. It stretches from high moorland in the south-west, through the scarps and vales around Warenford, to the plain south of Budle Bay. The moorland areas in the south and west are rich in upstanding remains, especially of the Bronze Age, with areas of field clearance cairns as well as burial cairns. In the lower lying areas there is a broader range of periods represented in the archaeological record, from prehistoric enclosures and burials, to former medieval settlements and post-medieval industrial remains. The earliest evidence for human activity belongs to the Neolithic with the find of a stone axe during modern farming activity. However, it is from the Bronze Age that the earliest standing remains have survived. Scattered across moorland in the south-west of the parish are many cairns, built for land clearance and burial purposes, but occasional burials have also been discovered in the more low lying areas to the north. From the Iron Age comes the first evidence of prehistoric settlement in the parish, with remains of round houses and surrounding defensive enclosures surviving both as upstanding earthworks and as cropmarks. Some of these settlements were occupied into the Roman period. Intensive agricultural activity is likely to have destroyed such remains in the low lying ground of the coastal plain but a number of enclosures have been discovered from aerial photographs and may also belong to this broad period. There is no evidence for any early medieval presence in the parish, despite the proximity of Bamburgh. 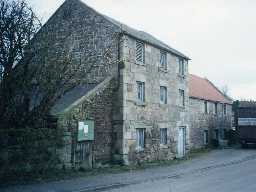 It is not until the medieval period that there is documentary evidence for several villages and hamlets, including Lucker, Hoppen, Bradford, Osberwick, Warenford and Cocklaw. Few of these settlements have any standing earthwork remains, but there is evidence of medieval agricultural methods with the survival of areas of ridge and furrow cultivation. Some of these settlements have continued to be occupied to the present day, either as a single farmstead or a hamlet. The turbulent nature of life in the Borders during the medieval period is demonstrated by references to at least four tower houses in the parish, at Cocklaw, Adderstone, Hoppen, and Newstead, which would have offered protection against the raiding Scots. In the post-medieval period a more stable way of life eventually appeared and in the 18th and 19th century a number of country houses were built with surrounding parkland and gardens. Several of these, along with their associated outbuildings, are now protected as Listed Buildings. Evidence of agricultural improvement in this part of the County is evident by the presence of lime kilns as well as several planned farms. A monument to more recent conflicts was a World War II pillbox at Lucker Station.